Mountaintop air, snow filled trees, and log cabin living. This is how the River 5 team started their time on Pine Mountain on November 26th. River 5 arrived to Kentucky straight from a disaster relief deployment; they supported the Hurricane Florence disaster response efforts in Bennettsville, South Carolina. Prior to that, the team had been working in Dauphin Island, Alabama to enhance the grounds of the Sea Lab. Additionally, they served for Keep Mississippi Beautiful, working on landscaping projects and teaching about littering and recycling practices throughout elementary and high schools. During the National Civilian Community Corps (NCCC) team’s stay in Kentucky, they assisted KNLT and their partners to make both rare/endangered species protection and outdoor adventure tourism opportunities a reality on Pine Mountain.The team was lodged in a cabin along the mountain at Pine Mountain Settlement School (PMSS) and spent most of their time maintaining trails for PMSS and KNLT. 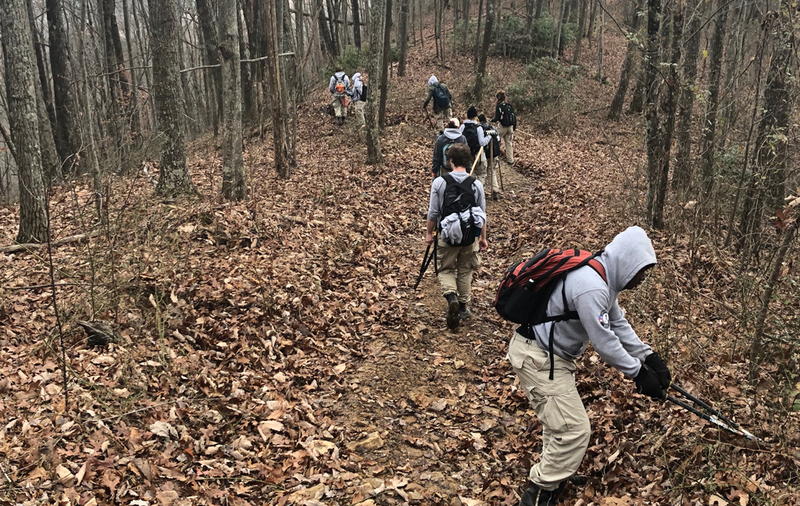 The team worked on KNLT’s Callaway Gap Preserve during December 3- 7th and was able to complete 1.8 miles of trail work. 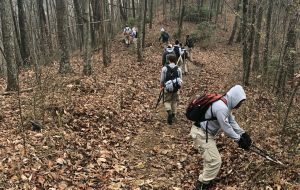 The trail work consisted of clearing out leaves and other woody debris and widening the trail using fire rakes and loppers to remove roots and limbs. They also leveled out a few of the steep parts of the trail and added some cribbing to deter erosion. The team cleared the underbrush and invasive species that were crowding the future parking lot area. Hopefully, the trail will open for hiking in the year to come. The AmeriCorps NCCC River 5 team enjoyed coffee and snacks from the Pine Mountain Café/Gift Shop just a couple of minutes from their cozy cabin. They were able to enjoy the beautiful mountain scenery and the company of Lady, the PMSS campus native (pup).